Tonkotsu ramen with pork belly. Over at ~NOMBE~, executive chef Mari Takahashi and chef de cuisine Pierre Mange have been busy expanding their ramen portion of the menu, aka the “it girl” on SF menus of late. 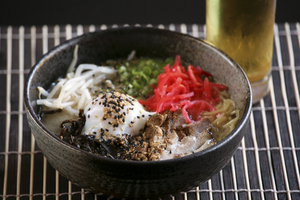 You can choose from three different broths: tonkotsu, a rich pork bone-based white broth; black tan tan-men, a black sesame-based spicy soup; and miso. All broths are $8, and garnished with bean sprouts, scallions, onsen tamago, and seaweed; the tonkotsu is additionally flavored with kombu and ginger. Diners can also add on pork belly, chicken kara age, and kae-dama (another portion of noodle) at an additional cost. Also new on the menu: a seven-course seasonal kaiseki menu, which will have a strong emphasis on the presentation of the dishes. The kaiseki menu will be a chef’s choice daily menu of the following: sakizuke (amuse-bouche), mukouzuke (sashimi), yakizakana (grilled fish), tomezakana (salad), shiizakana/agemono (grilled meat, or fried item), shokuji (rice, miso soup, pickles), and mizu-gashi (fresh, locally grown, seasonal fruit). The menu is quite a steal at $29.95 per person; you can say “kanpai!” with a sake pairing, available by sommelier Gil Payne. Both of these new menu options start Wednesday June 22nd, with the kaiseki menu available Sunday, Monday, Wednesday, and Thursday nights only.